Disruptive innovation is a term introduced by Clayton Christensen in his book, The Innovator’s Dilemma, almost 15 years ago. He described a process by which a product initially takes hold at the bottom of a market, moves relentlessly upward, and then finally conquers well-established competitors. Innovation that is disruptive provides opportunities to consumers who have historically been denied access because they lacked either money or the requisite skills. A great example of a disruptive technology is the cellular phone that has begun to leapfrog fixed line telephony in many countries, particularly in Africa. In the field of healthcare, there seems little doubt that the new breed of tablet personal computers, of which the iPad is the undisputed leader, will be the new disruptors. What is it about the iPad that makes it so compelling? First, it is portable (weight 600 grams, the size of an A4 sheet and less than 10 mm thick); second, it has a large colour display (1024 x 768 pixels) that doubles as an intuitive touch-screen interface; third, it has a powerful processor running thousands of software applications; fourth, it has connectivity, either through Wi-Fi or cellular network; fifth, it has an extended battery life of up to ten hours; and finally, it has two cameras that can capture both video and still images. Apple, the manufacturers of the iPad, are clearly intent on getting this gadget into the hands of doctors and Afshad Mistri is Apple’s secret weapon, their director for medical marketing. He must be doing something right. The Veteran’s Administration in the USA, with a network of 152 hospitals, is gearing up to roll out as many as 100,000 iPads in the near future. The devices have been used in a variety of ways, from accessing a patient’s electronic health record, to diagnosing a brain tumour from a computer tomographic image. 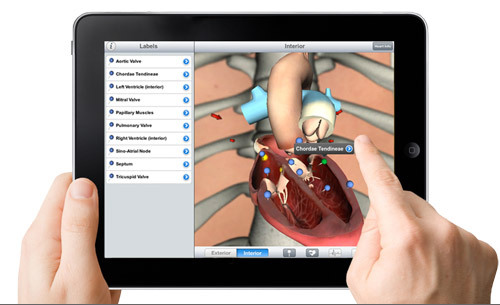 While the App Store now has a special room for healthcare applications, the opportunities for the iPad have barely been explored. Nevertheless, Apple and other companies developing applications for medical use must negotiate a regulatory tightrope as the FDA watches them intently. Whatever the outcome of the regulators’ deliberations, it appears certain that the iconic tablet will become a disruptive innovation of which Professor Christensen would be proud.